The Labour Court is expected to review the current nurses' dispute tomorrow morning ahead of a three-day strike scheduled for next week. Both management and unions have acknowledged that the strike will cause huge cumulative pressure on the health service. This is on top of the considerable disruption experienced over three days of INMO strike action and a PNA overtime ban in mental health services. However, informed sources stressed that if the Labour Court were to proceed to invite the parties to any kind of talks, it would not necessarily indicate any softening of the deadlocked positions of the two sides. Instead, it would be a last-ditch bid to avert chaos in the health service next week, which one source described as "potentially apocalyptic". Other sources said that time was of the essence as the HSE will soon have to start cancelling further appointments, causing additional disruption for patients. The General Secretary of the Irish Nurses' and Midwives' Organisation, Phil Ni Sheaghdha, has said there are many ways of dealing with their dispute within the confines of the current pay agreement. Speaking on RTÉ's Prime Time, Ms Ni Sheaghdha said pay had to be part of the solution, or else recruitment and retention of nursing staff would continue to be a problem. She said there had been no engagement from government departments or the HSE during any of their meetings with them. Ms Ni Sheaghdha said the strike had been 'entirely preventable' and that there was a cost in not resolving the dispute. She said that nurses had taken a 'very responsible approach' and that emergency measures and contingency planning would continue when industrial action resumes next week. More than 37,000 nurses belonging to the Irish Nurses and Midwives Organisation took part in their third day of strike action today in a dispute over pay and staff shortages. Once again, all outpatient, inpatient and day surgery appointments are cancelled, as are routine community nursing services and health centre nurse clinics. As on Tuesday, the strike has hit respite and rehabilitation units for the elderly or those with intellectual disability. The number of hospital and community health service appointments cancelled as a result of the nurses' strike so far has reached nearly 80,000, according to new figures from the HSE. The HSE said that today, more than 27,000 appointments have been cancelled. The figure involves 2,000 planned procedures, 13,000 outpatient appointments and about 14,000 community appointments. The first day of action resulted in 25,000 cancelled appointments, the second day affected 27,000 appointments and today's action has resulted in a similar number being affected, bringing the total to 79,000 patients or health service clients. Three further consecutive strike days are scheduled for Tuesday, Wednesday and Thursday of next week. Earlier, the HSE's chief clinical officer said it may not be able to give assurances that people who have appointments cancelled that they will be "seen again within weeks" if the strike continues into next week. Speaking on RTÉ's News at One, Dr Colm Henry said people who had appointments cancelled during the first two days of the strike received assurances they would be rescheduled within weeks. However, he said that if the strike progresses into next week, the HSE can no longer give that assurance. Dr Henry also said the rescheduling of appointments would have a "considerable, huge impact" on the health service. Speaking earlier today, the INMO's General Secretary Phil Ní Sheaghdha said that nurses and midwives were highlighting the risk that exists in the health service every single day due to staff shortages when asked about HSE concerns about mounting risks in the health service due to the strikes. Ms Ní Sheaghdha said two days of a dispute had lifted the lid on that. She said that all of a sudden, the HSE managers who are now working the 24-hour cycle with nurses recognise the risk. Ms Ní Sheaghdha said she did not believe that further strike action planned for next week would lead public opinion to turn against nurses, and defended contingency arrangements instituted for the industrial action. She said the public understood why they were taking the action and that the public health service was understaffed. Ms Ní Sheaghdha noted that the National Children's Hospital would need 300 additional nurses to open, but as there was absolutely no hope of attracting those numbers, they would have a hospital with closed beds. She reiterated the INMO position that the nurses' demands could be met within the terms of the Public Service Stability Agreement without triggering knock-on claims. Asked whether it was helpful that the Fórsa trade union had already notified its members that if any group got a special deal they would seek similar benefits, Ms Ní Sheaghdha said the bottom line was that as far as they were concerned there were unique circumstances in nursing and where there had been unique circumstances in other grades, remedies had been found within PSSA restrictions. Mental health services are also in the crossfire after the Psychiatric Nurses Association escalated its overtime ban to run through the night. The PNA says this highlights the unsustainable dependence on overtime and agency staff and reinforces the argument for pay movement to address the recruitment and retention crisis in nursing. 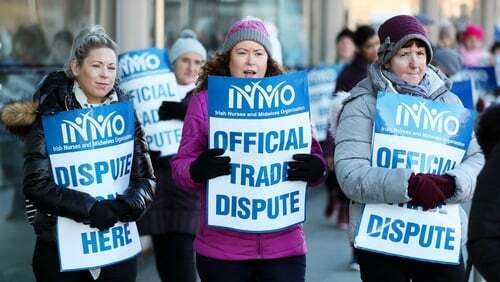 Next week sees three planned back-to-back 24-hour strikes with both the PNA and the INMO taking part. Management and unions agree that will put the health service under intolerable pressure. It is hoped the window between now and then might see the two sides soften enough to enter talks but that is not guaranteed. The HSE says it has had continuous engagement with the PNA and is working closely with it to try to address the issues that have arisen. It says that work is still ongoing. It added that it remains concerned about staffing levels and that liaison with the PNA is continuing.